At least it wasn't a Dustox like me. When breeding was introduced in Gen 2 thought it would give you a new Pokémon altogether. Having like 2 or 3 STAB moves on one Pokémon. Here's one. I used to evolve Clefairy as soon as I got a Moon Stone. Yeah, whoops. 1 - You can either be right, or you can be happy. 18 - There's no such thing as an unbiased opinion. 38 - Everyone always wants the last word. 45 - Never assume something is true without evidence if you don't want egg on your face. 46 - Debates never change peoples' minds. Just try to beat green with just lv 25 raichu in Pokemon blue ......it is stupid but it is some how work ......even i still in shock about it. I was probably 9 years old at time. 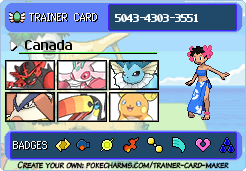 In Black, I evolved my Pansage as soon as I got a Leaf Stone (I think the clown at the entrance to Castelia City gives you the stone corresponding to your elemental monkey's type). That meant I missed out on Crunch, so he got stuck with Bite for the whole game. At least Bite has that chance to cause flinching. i messed up the yellow and silver games with my gameshark back then. the games still work normally without the gameshark but now some functions of the gameshark dont work on the 2 games. - Releasing pokemon. I can't remember why but I went through a phase where I caught and released pokemon constantly in gold. My first use of the Master Ball was on a Pikachu in the Trophy Garden. At the Battle Factory in Platinum, I thought the option to swap out Pokémon with your opponent after each battle was actually an option allowing me to permanently trade one of my party Pokémon for one of the Lv 100 Pokémon you get to use there, and was willing to trade off my starter for one before realising that wasn’t how it worked at all. I thought the Fire Stone would evolve any fire type, and was confused when my Monferno couldn’t evolve with it. In a different playthrough of Platinum, I trained my Piplup all the way up to Empoleon in the grass outside of Eterna City, “strategically” avoiding a grass type weakness by gaining the steel type. By BW I had wised up to these things and could play competently. I'm not sure if this would count as something stupid I did in the games, but we used to call Professor Birch (Hoenn's professor) Professor B*tch. How our parents didn't wise up to this, I have no idea. Maybe when we were kids, we didn't know what a birch was or how to say it, so we just said "b*tch" because that was the closest thing we could say. 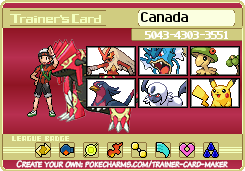 I once released my Blaziken in Ruby because I just wanted to find out what happened if you released your starter. Luckily I'd saved beforehand, so I could restart the game and have my beloved Blaziken back. You were supposed to fight May first on the route north of Oldale, then the footprint guy would realise he was just looking at Pokémon footprints and move out of the way for you. In my first ever adventure on Pokémon Silver, I defeated Entei and used the Master Ball on a Pineco. OH GOD I FORGOT ABOUT NAMES. So I was a thick kid and couldn't read properly (still have trouble sometimes) so I mispronounced SO MUCH as a kid. A. I couldn't find a way to reach beyond Vermillion. B. I had no idea, nor my kid mind understood on my own, to find an electronic device via fishing in Misty's GYM. C. Stuck on S.S Anne. D. Using a Master Ball on Onix at Mt. Silver. I used to pronounce Lt. Surge’s name as LT Surge, with the letters spelled out. I only realised years later that the LT was actually short for Lieutenant, since he’s supposed to be an American soldier who fought in the war. Even now, I still pronounce a lot of Pokémon’s names wrong. I keep saying Brionne as ‘Bry-oh-nee’, when it’s simply pronounced ‘Bree-on’. WishIhadaManafi5 and Cat's Eye Draco like this. My friend used to pronounce suicune as "suh-seen" and it drove me INSANE. When i was 8 years old, i play pokemon gold. When I saw the red Gyrados at this special lake, i tought it was an error. So i decidet to beat it. WishIhadaManafi5, BR4VE, Jirachi100 and 1 other person like this. WishIhadaManafi5 and Coolio35 like this. I remember the rumor of using strength on the truck near the S.S. Anne to find New, in the original Blue/Red version, even Yellow and the Pikablue rumor I was just recalling that the other day and thought maybe that rumor meant Marril. The Ultra Moon story mode play through party, are 5 perfect IV bred and E.V. trained, from OR, with select egg moves, tutor moves and fitted with OR in game shop balls; Each have, 8-13 ORAS in game badges; The UM 6 party team is: Vileploom (Nickname: Venoxic). Alakazam (Bahseer), Clawitzer (BentBane), Mismagius (Curavenn), Dralgalge (Pwisto) and Umbreon (Lurid). I think, this team would be a-lot better Re-E.V. trained but, other than that, they each have potential. Almost, finished R.R. Chapter and I decided to do other things before, completing the R.R. Chapter. If interested in trades or, conversation about P.K.M., message me. 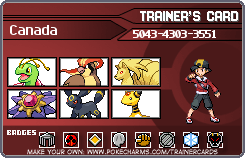 In Yellow version my most powerful pokemon was a Pidgeot, the other 5 Pokemon I had in party were really low in level and pretty much useless in the Pokemon League. I used this pidgeot several times in the Pokemon League after, several fails my pidgeot was in the level 90s and I finally won with just pidgeot and a-lot of the moves Fly. I had to replenish pp, too.